At the end of the summer holidays, I had the great chance to visit the Mediterranean island of Malta. It was my first visit here, so naturally, I was intrigued and excited about what I’d actually find. One thing that immediately drew my attention, was the amount of natural stunning light, which helped me to enhance my photos even more, in an already photogenetic setting. For me, this country provided me with the perfect opportunity to capture some stunning images. Let me take you on a photographic journey through Malta and Gozo! My starting point was in the capital of the island and a very old city of Valletta. It is a charming place, with so many photographic opportunities. With many amazing buildings, it was the perfect place to simply walk through the old centre and let yourself be amazed by the number of narrow cobbled streets and the architecture. A highlight and must-see is Valletta's beautiful gardens; the Upper Barrakka Gardens, the Hastings Garden and Lower Barrakka Gardens, which gives you an amazing view over the Three Cities. Another highlight and a location that allows for more great photography moments. The ‘Three Cities’ is a collective description of the three fortified cities of Birgu, Senglea and Cospicua in Malta. The oldest of which is Birgu. It has existed since the Middle Ages and again has some enticing places to wander and explore. The Vittoriosa Yacht Marina, Cospicua, St. Lawrence’s Church, Birgu and the Fort Saint Angelo, Birgu. Where just a few of the places that really caught my attention. Admirable colors arise at sunset. Great for photographers! The Marsaxlokk is Malta’s foremost fishing village and I think, the most picturesque seaside location found on the island. It is another interesting location from where you can admire the many small fishing crafts, called the Luzzu and Kajjik. Which are perfectly painted in vivid colours of red, yellow, green and blue. They provide a magical focal point, especially when they are seen bobbing lightly upon the calm turquoise waters of the bay. Located in the less popular Southeastern part of the island, there are some of the islands’ most extraordinary sites, which you should definitely make every opportunity to visit. As a result, they are a ‘must-see’ for any foreign visitor. The magnificent Blue Grotto is one of those places. 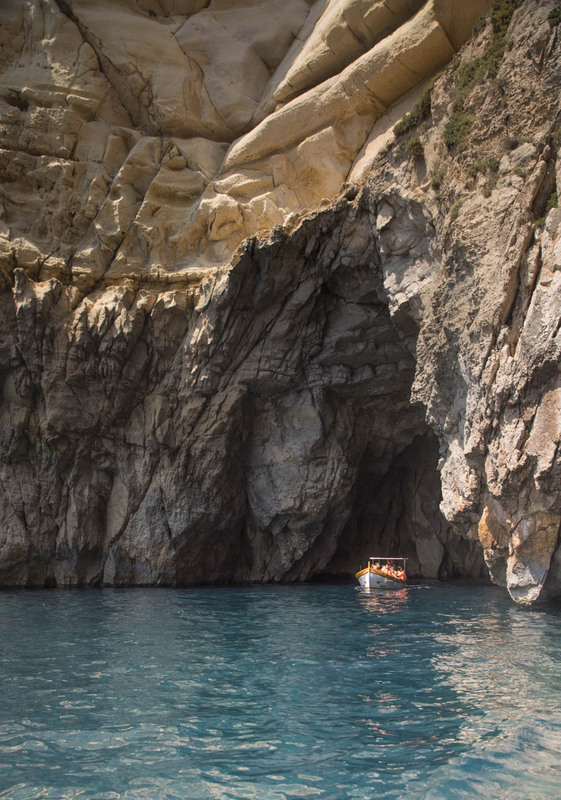 This popular attraction lures over 100,000 visitors per year, with many tourists flocking here to see the wondrous grotto via local boat trips. It’s also an extremely popular diving and snorkelling spot, with very clear, clean and deep waters. The crystal waters and rocky backdrop allow for some enticing photos. The village of Ix-Xewkija, lies halfway between the pretty Mġarr Harbour and ir-Rabat, is the oldest village in Gozo and is best known for its amazing rotunda. This wondrous spectacle is the circular church at the centre of the village. 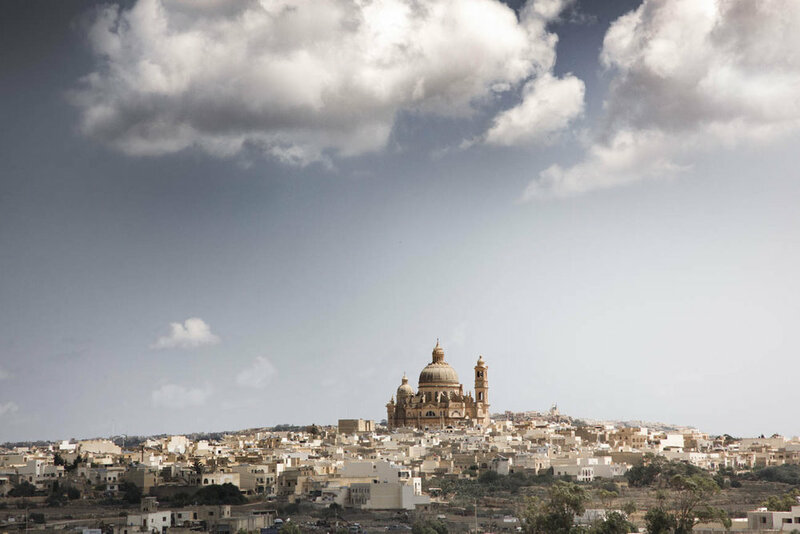 Gozo’s largest church, its dome is a distinctive landmark visible across much of the island. The church itself is superbly crafted from local Maltese stone and the interior is decorated with fine sculptures and modern paintings. This glorious feature is yet another must see location. Rotunda church in Xewkija, which is the oldest village of Gozo. Another great natural feature can be found at Qbajjar. Here, the Saltpans have been harvested in the area since Phoenician and Roman times. The impressive Xwejni Salt Pans stretch for around 3 kilometres along the coast and are around 350 years old. The salt is harvested during the summer months, May to September and is still done by hand, which forms incredibly hard work in the intense heat. The crystals are then scraped up, stored and processed in the caves, which have been carved into the coastal rock. Walking along the coast with a warm breeze coming off the Mediterranean sea and seeing the patterns of the salt pans, is really something else. I feel very privileged to have visited the intriguing islands of both Malta and Gozo. I loved the experience and certainly enjoyed capturing images from these special places, on islands that are very suited to my style and feel of photography. Have you visited Malta yet? I would love to see your images! Any tips or further recommandations are very welcome, please leave your comment or URL below! This trip wouldn’t have been made possible without the very kind invitation from the people at Visit Malta, who provided me with a great itinerary, to explore and immerse myself in this amazing corner of the Mediterranean.